My daughter Courtney is getting married this Tuesday and family members are starting to arrive for the wedding. My mom and dad arrived yesterday so I made them some food knowing that it might be the only time I have to do that while they are here. 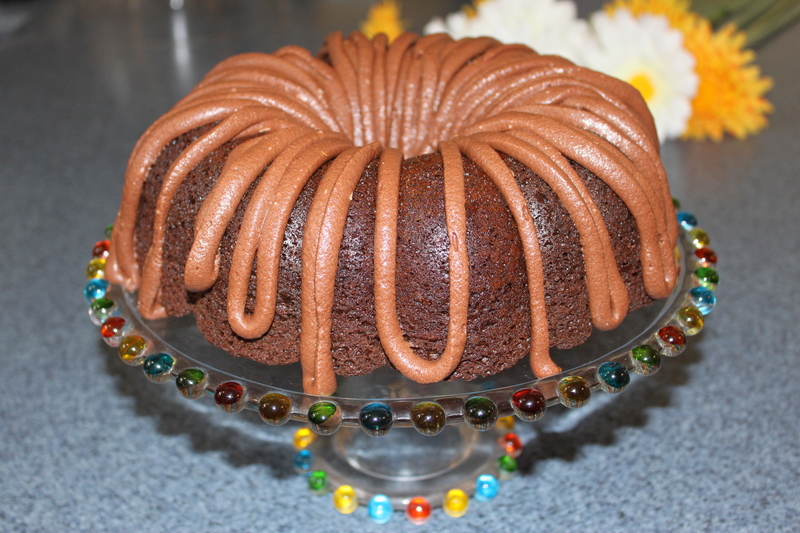 I made them “Slow Cooker Italian Spaghetti Sauce”, “Easy Homemade Rolls” and this delicious and easy cake from one of my favorite blogs, “Six Sister’s Stuff”. 2 Mix together cake mix, pudding mix, sour cream, oil, eggs and water, then stir in chocolate chips. Pour batter into bundt pan sprayed with nonstick cooking spray (I use Pam for Baking). 3 Bake 45 – 50 minutes or until top is springy to the touch and a wooden toothpick inserted comes out clean. Cool cake thoroughly in pan for about 90 minutes (I only did about 30 and it was fine) before inverting onto a plate. Dust with powdered sugar or top with frosting (see recipe below). I can’t which is best – the cake or the platter it’s sitting on? The platter is awesome, isn’t it? It also has a dome to top it. My friend Barbara gave it to me for my birthday!